Just because you’re not doing work right now doesn’t mean there’s no work to be done. I’ll bet you’re just about to get started on that work right after you read this. Well… you do have to return that phone call first, but then you’ll do work. Oh wait… but isn’t it someone’s birthday today? You’ll just check Facebook and make sure you’re not being so incredibly rude by not wishing your friend (read: that acquaintance that you very rarely talk to) a happy birthday. It’ll only take three minutes and then, you swear, you’ll take care of work. Sound familiar? If procrastination and a lack of focus are problems for you, check out the infographic below by Anna Vital, information designer at Funders and Founders. 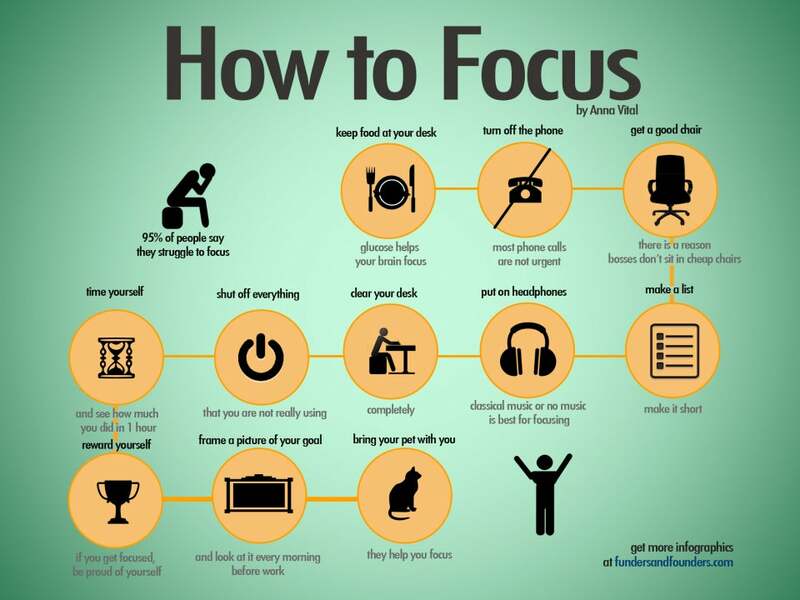 These 11 tricks to help you get your focus on, if you can pay attention long enough to remember them. Some Cliff’s notes: Classical music and pets are helpful, a cluttered desk and an uncomfortable chair are not. Check out the rest of the advice and get to work.